The worrying growth of inequality in the UK over the last 30 years is something that we’ve heard a lot about recently, and that the situation has been replicated in English football is not news to anyone either. Television revenues have enabled the Premier League rich kids to push their salaries through the roof, from £75 million in 1991-92 to £1.87 billion in 2012-13. In 2012-13 the average Premier League club received £60 million in television revenue, while clubs in the fourth tier of English football, Sky Bet League 2, received just one hundredth of that amount. However, despite these historically high levels of disparity, there is still more money in the lower leagues than ever before and this is the world that Simon Akam investigates in The Club. At League 2 side Luton Town, Akam is given full, behind-the-scenes access to players, facilities, fans and non-playing staff. We get to visit the training ground and meet the club physio, Simon Parsell, who treats players in a portakabin and bemoans the lack of top-quality resources to treat his players. Similar stories are brought forward by the club’s groundsman and Head of Catering; for all their dedication to their roles, there is a frustration regarding the constraints that they face due to limited funds. There’s little surprising about this so far but the interviews are interesting in themselves and the scenes which Akam describes make for a thoroughly enjoyable read. On the training ground Akam joins in with practice, before quickly falling away when he is unable to keep pace with the athleticism of the League 2 players. In another portakabin, a humorous scene takes place as an electricity meter reader, a Luton fan, overstays his welcome. As Akam notes, ‘the high god of banter’ needs sacrifices. Perhaps best of all is the club’s young data analyst bravely attempting to persuade Luton manager John Still to buy better equipment, battling on in the face of sweary hostility. In the book we meet some of the players who emerge from a wide range of back grounds. Higher league cast-offs, lower league journeymen, and ex-builders making their way in professional football for the first time; these are the men playing what Akam rather poetically describes as somewhere ‘between the gutter and the stars’. We meet club captain Stephen ‘Sumo’ McNulty and go jeans shopping with Jonathan ‘Smudge’ Smith and Danny ‘Fitz’ Fitzsimmons. In a look at the celebrity status of footballers at this level, we also meet one of the girlfriends, former S Club Junior member Stacey McLean. Next up for Akam is the social makeup of the club’s support. Luton has a large Asian population on its doorstep and The Club looks at what Luton Town means to them. Alongside the well-known rationale – Asians prefer cricket, prefer to watch matches on TV, don’t like standing in the cold – are some interesting insights. An unknown source suggests that initial racism alienated fans from football over the past decades, and while work has been done since to improve relations, large-scale Asian support would only come when a local Asian player became successful at the club. On the opposite end of the scale, an interview with EDL founder and life-long Luton fan Tommy Robinson makes for interesting reading. The one small gripe I have with The Club is that though it offers an insightful snapshot of life at Luton Town, it is just a snapshot of lower league life, and not an in-depth study. In fairness to Akam, that would have been beyond his remit here but many issues which he touches on could be the focus of research in their own right. Akam spends just a week at the club in the first instance, returning 6 weeks later for a second trip. Another issue is Luton’s unsuitability as a lower league example. The Hatters missed out on the Premier League by just one season, having been relegated in 91-92. In terms of stature, Luton Town would not be out of place in the Championship, and funds are available to offer some players up to £75k per year. Sadly, Akam’s approaches to Mansfield Town, Hartlepool United, and Morecambe FC, who collectively have managed just one season in the second tier between them (Mansfield in 77-78), were declined. Ultimately though, The Club is an enjoyable and interesting look inside a lower league football club, and surely a must for any Luton Town fan. 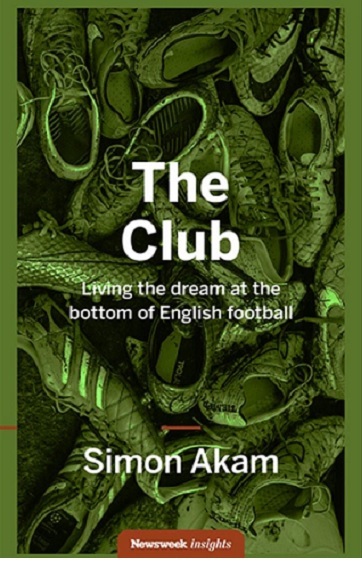 In what is a short book, Akam covers a wide range of lower league issues, not least the financial risks being taken by everyone including the players. Many leave secure jobs to embark on what is increasingly a very unstable career as a professional footballer. However, financial remuneration is better than ever before, minor celebrity status is achieved (in the locality at least), and the chance to play every Saturday, ‘somewhere between the gutter and the stars’, is something that most football fans would still do in a heartbeat… wouldn’t you?